An alleged contract killer accused of the murder that sparked the deadly feud between the Kinahan cartel and the Hutch gang claimed yesterday that he was in bed with "a prostitute and hangover" at the time of the killing. Dubliner James Quinn (35) - a nephew of veteran criminal Martin 'The Viper' Foley - broke a near three-year silence to insist he was not at the Costa del Sol apartment block where Gary Hutch was assassinated with two point-blank shots to the head after being chased around a swimming pool. He told a jury at the start of his trial at a court in Malaga for the September 24, 2015, murder: "I flew back to Spain from Dubai a couple of days earlier to attend a wedding. "The morning of September 24 I was in bed with a hangover and a prostitute." Asked by state prosecutor Jose Barba if he could remember the woman's name, the dad-of-one from Dublin said: "I didn't know her personally." Quinn, who has previously refused to answer police questions about the grisly crime, spoke during a 25-minute address to the jury of five women and four men set to decide his fate after brief opening speeches by lawyers. Three armed police stood behind the Irishman as he gave his evidence while another kept his eyes fixed on the public gallery, and a fifth officer guarded a back entrance to the court building. Quinn, in a blue designer suit, white shirt and blue tie, was aided by a translator sitting beside him. He admitted under cross-examination he did not pay taxes but insisted he had a proper job, saying: "I rented tables to certain people in exclusive clubs in Puerto Banus and hired out luxury boats to some of those people. "I was always paid in cash. I put some of the money in the bank and kept the rest." He said he knew Gary Hutch, a nephew of Gerry 'the Monk' Hutch, because they used the same gym in Puerto Banus where cartel bigwig Daniel Kinahan trained at the time, but added: "We associated together but he wasn't a friend." Mr Barba said Hutch was targeted in the garage under his ground-floor flat where his car was parked on a residential estate in Miraflores near Fuengirola in southern Spain. Mr Barba described the assault as a "surprise attack" and said police had found the dead man's car door open and his keys on the ground by his left hand. "Quinn fired off some 15 shots as he chased his victim and they ran round the community swimming pool twice," he told the jurors in an opening speech after part of the eight-page indictment against the defendant was read out. "Some entered the victim's back and he fell on the ground with no chance of defending himself before the accused finished him off from close range with two shots to the head." Police found 10 mobile phones, €50,000 in 500 notes, a knuckle duster and a Japanese sword inside the apartment Hutch was renting. DNA taken from the cap, which Mr Barba told jurors survived an attempt by the dead man's killers to torch everything inside their getaway BMW X3 near the murder scene, was matched to Quinn. 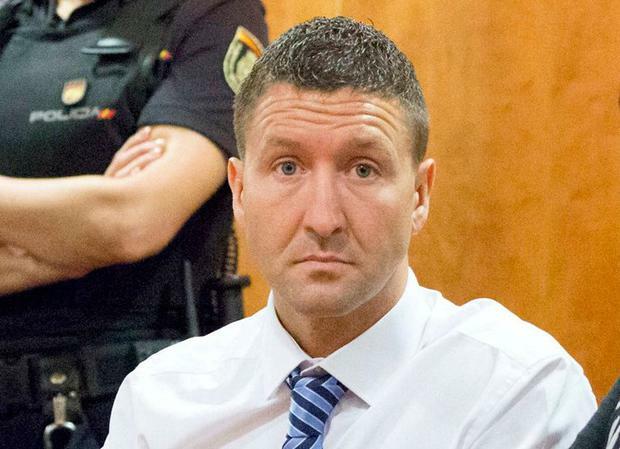 Jurors heard, in details which have never before been made public, that the Irishman was arrested a year after Hutch's murder following DNA tests on a bottle of water he drank from which undercover cops seized on a high-speed train from Madrid to Malaga. Two unlicensed guns he allegedly used to kill Hutch, a 9mm Glock 26 semi-automatic pistol with his DNA on it, and a .45 semi-automatic Colt M1911 pistol, were subsequently found during a search of a property he is said to have been staying at. "The defendant didn't kill his victim for the love of it. He killed him because he's a contract killer working for a criminal organisation," Mr Barba said. "The murder sparked an international war between two criminal gangs which has led to the loss of life in Ireland and Spain." Pedro Apalategui, defending Quinn, said: "The fact Gary Hutch suffered a violent death is not up for debate. The question is who killed him? I say it wasn't my client." He also questioned how police had come by the "practically new" baseball cap linking his client to the murder, highlighting the fact the inside of the getaway vehicle it was "recovered from" was gutted, and insisting no mention had been made of the cap in police reports before investigators obtained Quinn's DNA nearly a year after Hutch was killed. The ongoing gangland feud between Daniel Kinahan's crime cartel and the Hutch mob has claimed up to 18 lives in Ireland and Spain, including two innocent men. Gary Hutch was reportedly living at the complex where he was killed after returning to Spain following the brokering of a €200,000 deal to compensate the Kinahan crime cartel after a botched attempt to shoot Daniel Kinahan at his rented Spanish home. State prosecutors want Quinn jailed for life if he is found guilty of Hutch's murder. The father-of-one says he is innocent. The trial, expected to finish on Thursday before jurors retire to consider their verdict, continues today with evidence from police and forensic experts.